We at Thread Head Fabrics are really enjoying this simply fantastic summer weather of late. The never-ending sunshine is making the UK feel more like Spain! Perhaps, though, there are only so many beach days you can take. 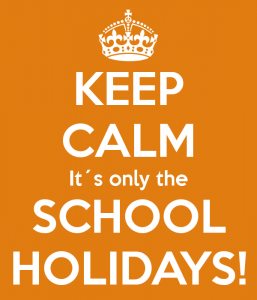 This may be particularly true when you are trying to keep kids engaged during their school break. Summer holidays are in full swing and for those of you with little ones, you may already be thinking ‘now what can I do to keep them entertained?’ When you get the occasional rainy day or if you’re looking for a home-based form of amusement, why not try a creative adventure with your child? We’ve come up with a fun-filled, child friendly list of truly cool craft ideas that will appeal to your little ones. Truth be told, I’m thinking there’s a few of these that I want to make to keep for myself! These boredom busting ideas will be your go-to list when the kids start to complain that there’s nothing to do. Click on the highlighted links for full instructions. 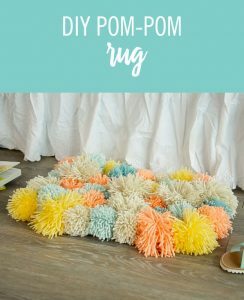 Easy Peasy Pom Pom Mat – I *love* this idea! In fact I’m going to make one of these for ourselves as a nice cushy mat for my feet at my cutting table! And as someone who works with adults with learning difficulties and mental health issues, I think this will work out so nicely for them to create something they will use and feel proud about! You can read the full tutorial here and just dig out some old wool, an empty paper towel roll, scissors and a size appropriate non-slip, open weave rug mat. You can pick these up at Ikea or a your local pound shop. 2. Monster Softie – This one is just too cute, but also very cool! It will turn even your most anti craft child a craft convert! The full tutorial is here. You’ll need to have an unwanted or spare odd glove, some wadding or extra toy stuffing (you can always recycle from an old toy or cushion) and a bit of felt. It’s not too tricky and the end product is awesome! 3. 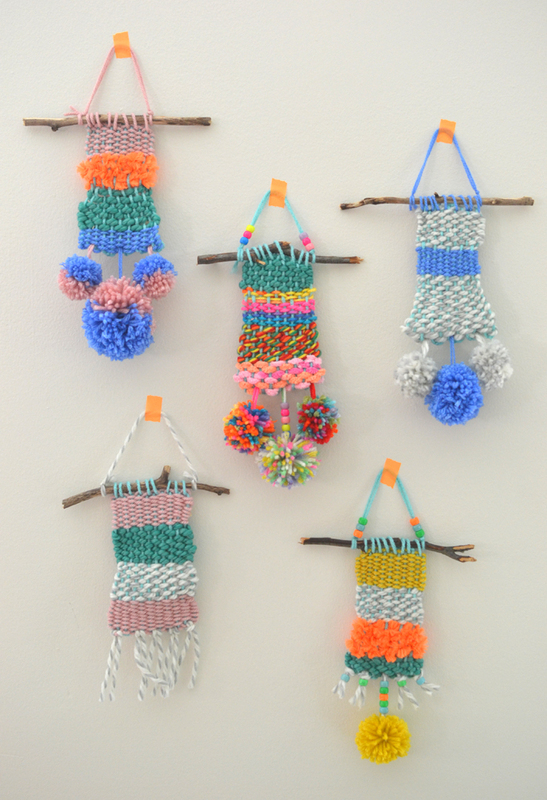 Colourful, Creative Loom Weaving – I’ve worked on this project with my craft group and it was a huge hit! It looked so beautiful just using found twigs from a local park, recycled cardboard, plastic needles (available on eBay, or in most craft shops) and leftover wool. Plan ahead and this could be one to do during a long car journey or while away on a camping holiday. The full tutorial is here and while you’re at it, you may just want to have a go at this for yourself! Oh! And you won’t need a pom pom maker if you follow the instructions in the pom pom rug tutorial. 4. God’s Eye Mexican Weaving – Another tried and true project, I used to make these with students when I was a teacher back in Houston, Texas as part of celebrating Mexican culture. I also used this activity with my adult craft group here in Liverpool and they loved it, too! I skipped the rubber band suggestion in this tutorial and instead just used a bit of the wool used in the weaving. You can make these with both popcicle sticks (or lolly ice sticks as they say here in the UK! ), recycled coffee stirrers from your take away coffee, or found twigs from your local park. 5. 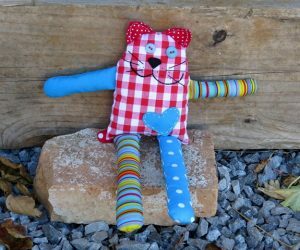 Cool Cat Soft Toy – If you’re child is learning to use a sewing machine, this project is a good introduction to using a pattern. Plus you end up with a really fun soft toy for the effort! 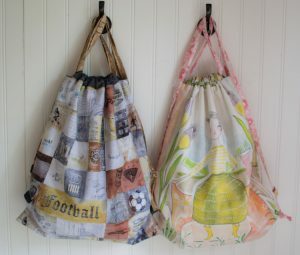 This project also allows you to use up some of those odd scrap fabrics from your stash that you just cannot throw out, but in all likelihood you’ll probably not use them in a future sewing project. Follow the tutorial here and spend some quality time working on this project together with your child. 6. Learning to Sew on an Embroidery Hoop – This tutorial is perfect for younger children! 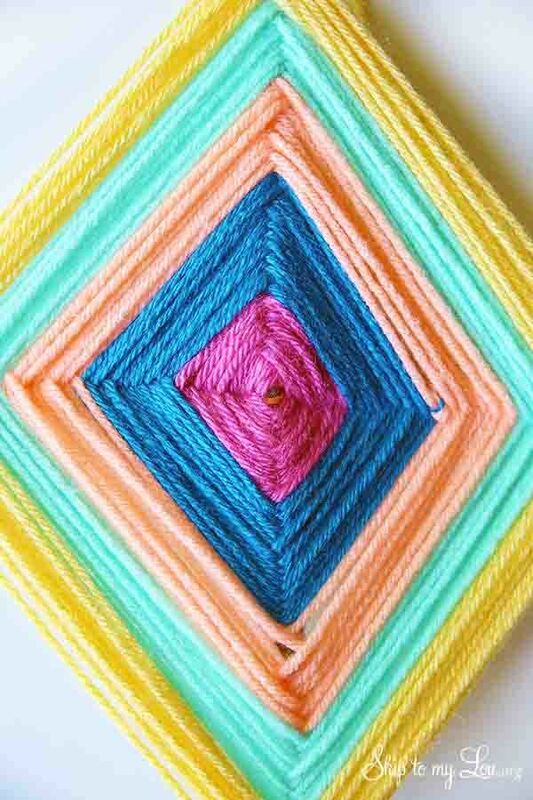 The result is sweet and could make for some beautiful wall art for a child’s bedroom! And ok, I admit it. I’m out of the loop with newer story books for kids, but the book about Pete the Cat and His Four Groovy Buttons is available on Amazon along with oodles of others in the Pete the Cat collection by Eric Litwin. 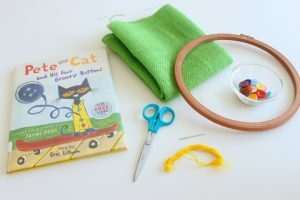 I love the idea of connecting books with a craft project! Why not make a day of it and start with a trip to your local library to find a Pete the Cat book. Maybe you could turn the Cool Cat sewing project into a Pete the Cat with a bit of alteration to the design? 7. The One Yard Messenger Bag – Check out how easy this project is and I’m guessing you and your child will both be stitching up a chic messenger bag! You only need one yard (a little less than 1 metre!) of fabric and some basic cutting and machine sewing skills! 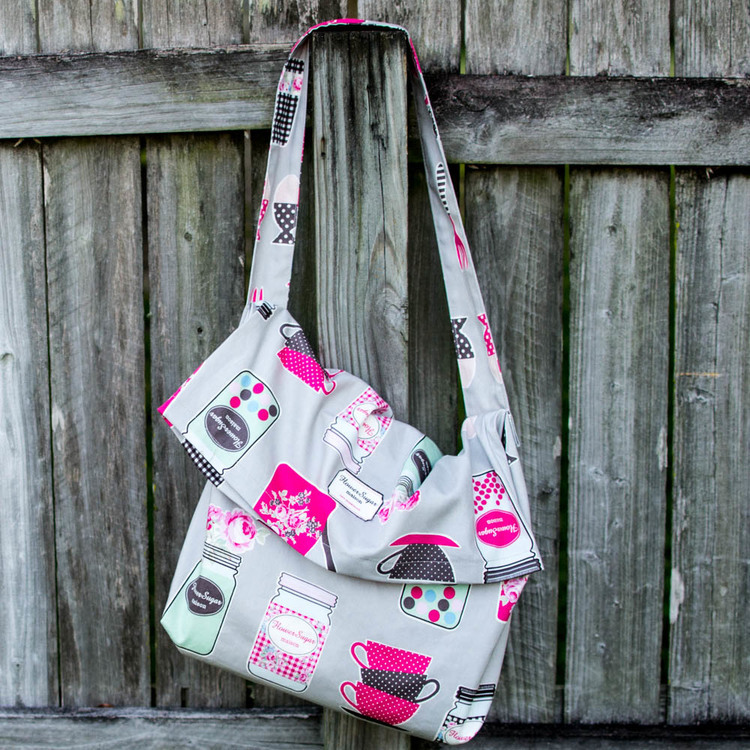 Choose some funky prints and you could create a go-to bag for a day at the beach! 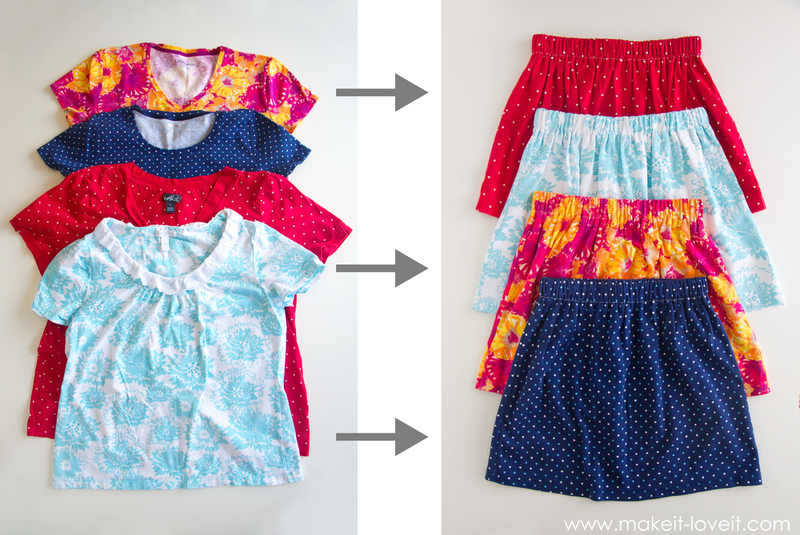 Have a peek at the tutorial here and get sewing! 8. 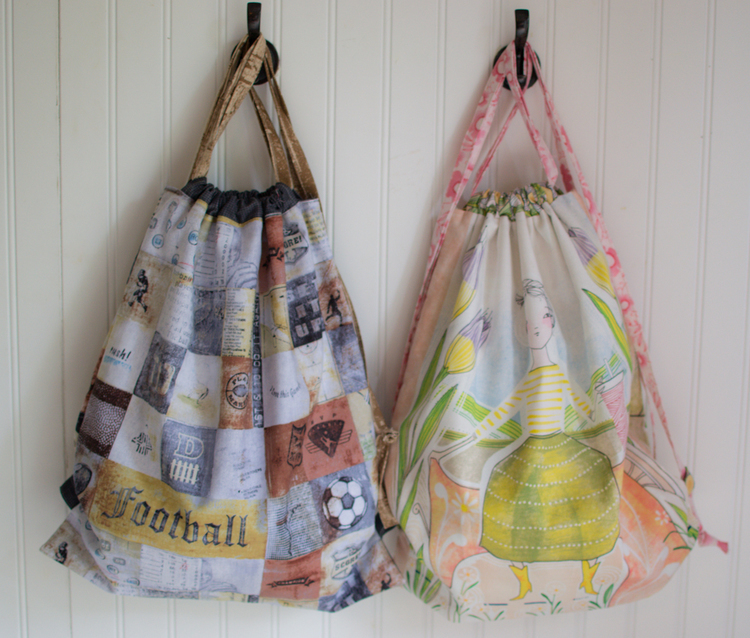 Easy Peasy Drawstring Backpack – No need to tell the kiddos this one is a back-to-school project in disguise! Perfect for a PE kit, after school club gear, stowing Legos, sports gear, an overnight at Nana’s … you name it! Create this one with your child and let them choose their own fabrics and watch their sewing confidence and pride shine! The tutorial is here and it can be stitched up in no time! Why not have a go? 9. The 10 Minute Upcycled T-Shirt Skirt – Yup, here’s another project I’m thinking I want to make for myself! Everyone has at least a few old t-shirts knocking around in the wardrobe too beloved to throw out, too worn out for a charity shop donation. You know the kind. Well here’s a perfect project to turn those tired treasures into something new! It’s such an easy sewing project that you’ll want to make several and the skirts can be used over leggings for season-spanning wearability! Lovely and earth friendly! 10. 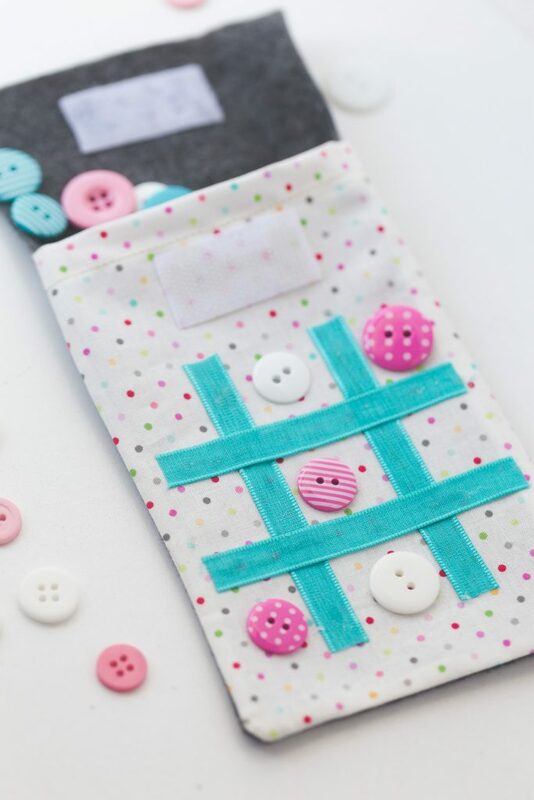 On the Go Tick Tack Toe – AKA Naughts and Crosses, this is another fabulous quick and easy sewing project for creating something for long car journeys, camping holidays, holidays abroad and the like. The game is so portable it will take up very little luggage space! It would make a sweet birthday gift for your child’s friend, too. Follow the tutorial here and you’ll have a new game for your child in no time flat! So there you have it! 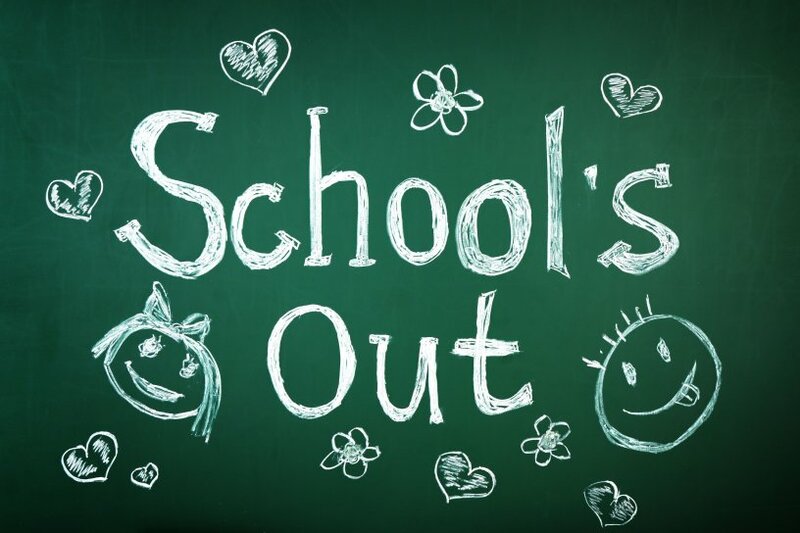 Ten wonderful sewing and craft ideas to keep your children engaged and creating throughout the school holidays! If you do end up making any of projects we’d love to see a pic! 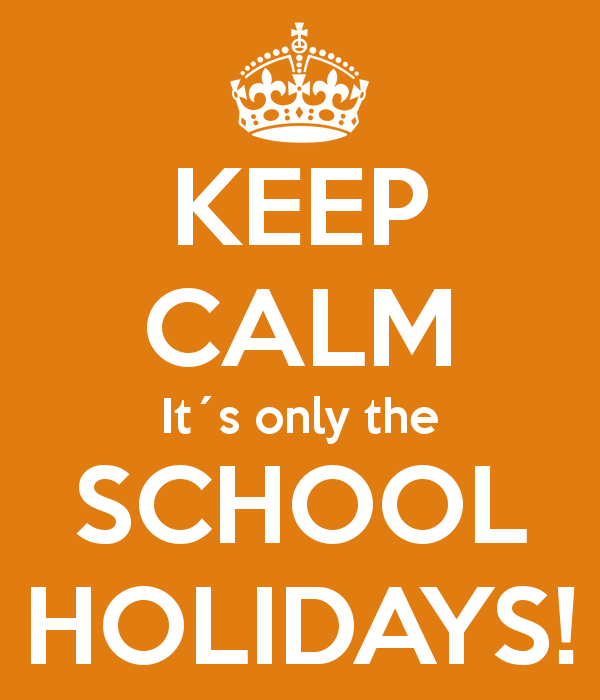 Just remember to have fun and enjoy the rest of this amazing summer! Happy Sewing and Happy Crafting! This entry was posted in Children's Craft Ideas, How To's, learn to sew and tagged children, craft, craft ideas, kids, kids' crafts, pom poms, sewing. Hi Jacquie! Thanks for the comment. I hope you and your granddaughter enjoy creating the bag! Can you imagine how happy her dad will be to receive a handmade gift like that? Beautiful! Thank you for the round up! These projects all look great and would be perfect for handmade gifts. I love the weaving especially, it’s something I’ve always wanted to give a go! Anna! Go for it! Honestly, I did a weaving project with my group and I kept thinking of ways to make the weavings even more creative. There’s a lot of inspiration on Pinterest and then it’s just down to your own use of texture and colour. Lots of fun! Thanks for the comment!